A concise snapshot of the prevailing military culture regarding Muslims. In this timely sociological study, Sandhoff (Sociology/Indiana Univ. of Pennsylvania) traces the personal stories of a diverse collection of 15 Muslims who served or are still serving in the U.S. military since 9/11. Most are men, but there are a few women, and all self-identify as Muslim, including a convert. Most express positive experiences, but some are mixed and a few, negative. First, the author provides an overview of Muslim history in America and the change in attitudes since 9/11, when “being Muslim American became complicated.” When the author approached her subjects, she wondered, would she find that the military, as an important social institution, provided a protective, supportive environment to society’s marginalized members, or would she find “a problematic one”? On one hand, the U.S. military integrated African-Americans in the 1940s, but on the other hand, Japanese-Americans were incarcerated and dehumanized because they were associated with the enemy. Homosexuals were first excluded, then tolerated, then allowed to come out, and women were grudgingly incorporated. Sandhoff astutely compares the Japanese-American example to that of the Muslim-American: both sought to join the U.S. military in order to prove their citizenship and their loyalty. 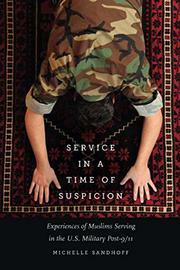 These same themes recur in the stories that the author elicits from her Muslim-American soldiers. Many hail from military families; some are observant regarding daily prayers, fasting, and dietary restrictions, of which the military has now become more accommodating. As a leading social institution, the Army’s use of “diversity leadership” plays a huge role in how Muslims are made welcome or not. Many of the soldiers reveal the general ignorance in society about Muslim culture; one, Zafir, felt he was treated unfairly and his talents wasted, while another, Farid, had his family targeted in Pakistan because he was an American soldier in Afghanistan.